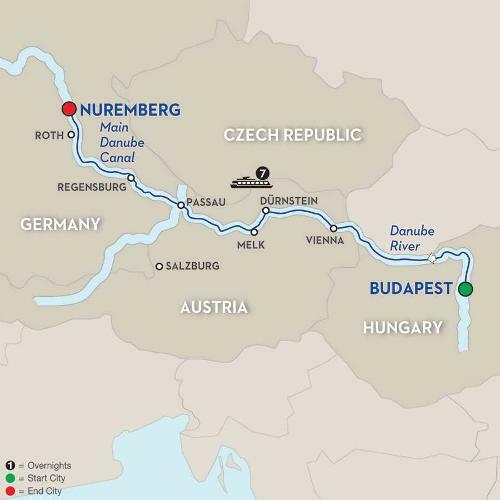 Explore European Jewish Heritage on board this timeless Europe river cruise vacation in vibrant Budapest, Hungary, sail along the Danube River with exciting stops in Austria and Germany, and conclude in historical Nuremberg, Germany. As you leave Budapest, you’ll sail past the splendid Parliament Building, and along Danube River, you’ll have Hungary on your left and Slovakia on your right as the river runs between both countries for a 58-mile stretch. Join a guided tour of Vienna and discover the city’s Jewish life in the last century. In the heart of the Wachau wine region is Dürnstein, a 16th-century town with charming cobblestone streets and the baroque Stiftskirche with its luminous blue façade. In Melk, visit Austria’s majestic Benedictine Abbey, one of Europe’s largest monasteries, and enjoy a tasting of some of the Wachau Valley’s famous wines. You’ll love a guided walk through Passau, with its narrow streets, beautiful Patrician houses, and baroque architecture. Sail further up the Danube River, and you’ll come to the medieval walls of Regensburg, the only German city not bombed during WWII. There, follow the traces of the Jewish history from the middle ages. The last stop on this memorable European river cruise vacation is the thousand-year-old city of Nuremberg. During guided sightseeing, marvel at the medieval fortifications, extraordinary gothic churches, and the Imperial Castle. And in your free time, be sure to make a wish at the striking fountain on the Hauptmarkt (Main Square)—a perfect ending to a memorable river cruise vacation!